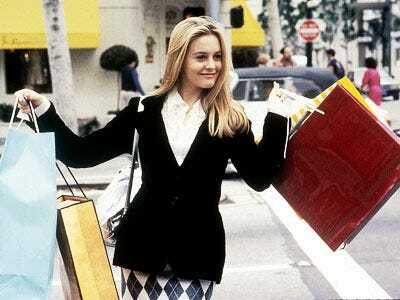 Same store sales numbers for e-commerce sites are suggesting the rebound is very real, with February showing a 5% growth over January and Q1 2010 showing a 3% growth over the busy holiday shopping Q4 2009, according to TBI Research. Amazon has used this growth make clear gains in the third party resale market, notching 2% in February over January. Its key rival, EBay, has failed to make similar strong moves of late, according to TBI Research. ChannelAdvisor same-store sales (SSS) increased 17% in February, an acceleration over January’s 12%. In addition, the company said March SSS should come in slightly better than February. Overall, this means ChannelAdvisor’s Q110 results are pacing just ahead of Q409 growth. Another company that helps retailers sell their products online, Mercent, said its Q110 was on pace to grow about 35% – a slight improvement over Q409 growth of 32%. Collectively, the two companies manage nearly $4 billion in overall e-commerce sales so are a fairly good indicator of overall industry trends. 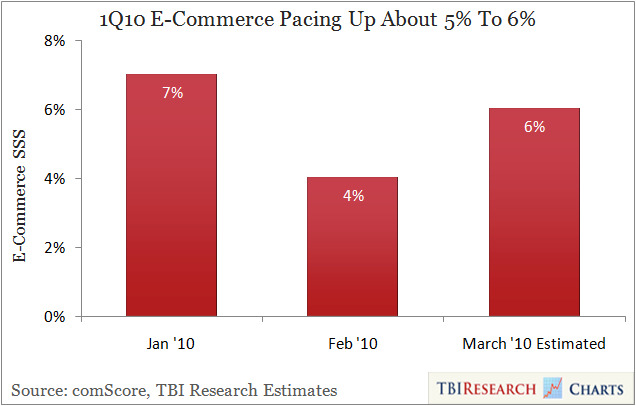 As a result, it appears Q110 e-commerce industry growth could be slightly better than Q409. This bodes well for e-commerce companies Amazon and eBay. Both forecast Q110 e-commerce growth to be slightly below the strong Q409 holiday season, which would indicate the quarter is pacing slightly ahead of expectations. Amazon SSS at ChannelAdvisor were up 77% in February, better than the 75% posted in January. Mercent is seeing upwards of 60% SSS in Q110 on Amazon. eBay SSS at Channel Advisor were up only 5.38% in February, better than the 4.6% posted in January. ChannelAdvisor said most of its clients were spending heavily on improving their online offerings, primarily by optimising their sites for search and conversion once customers find them. This is good for Google, which has been aggressively expanding initiatives to capture a greater share of e-commerce transactions (CPA Product Ads and Comparison Ads among the strongest of these efforts). In addition, interest from ChannelAdvisor clients on social media and mobile is “exploding” according to the company. Increased interest in social media is bad for Google since it is not active in this space (Facebook is the far and away leader). Increased interest in mobile is good for portals like Google and Yahoo, which have recently launched search products for mobile catered to retailers. We expect the next step in this process to be incorporating ads around these products.